You are familiar with that little, pale box on the grocery store shelf, right? Humbly it identifies itself as Vanilla Pudding Mix. But you and I know it is a shortcut gateway to a huge assortment of delicacies! Today is its day to shine: National Vanilla Pudding Day! So where to start? Delicate, moist S'more cookie? Tender Chocolate Chip cookie? Check! How about a shortcut to a moist Vanilla Cake? Check! Caribbean Rum Cake? Check! 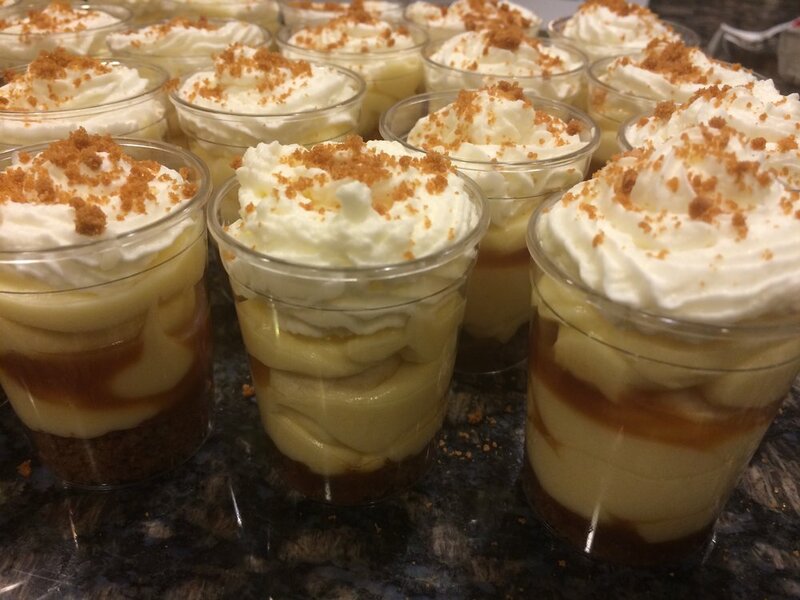 My Favorite, however, is my Mini Dulce de Leche Banana Cream Pie, tweaked to be served for a crowd in mini 2-4 oz cups. So as the days grow longer and warmer, treat your loved ones (or yourself - I promise, I won't tell) to this creamy and refreshing incarnation of our humble Vanilla Pudding. Spoons optional - fingers work well too! 1. Melt your butter in the microwave in a dish then place your graham crumbs in the bowl. Mix quickly with a fork. Place 2 tablespoons of graham mixture in the bottom of each ramekin and press down gently to form a crust. Cut up 2 and a half bananas into slices and pop them on top of graham layer. Drizzle with a little caramel sauce. 2. In a medium bowl, combine pudding mix, cold water, and sweetened condensed milk. Mix well and place in the refrigerator to chill for a few minutes. In another bowl, whip 1 c. of whipping cream until soft peaks form. 3. Remove pudding from the fridge and gently fold the whipped cream into the pudding mixture until well-combined. 4. Fill ramekins with the pudding mix to the rim. Whip the second cup of whipping cream with the last 1/3 powdered sugar and then pipe decoratively over the ramekins’ tops. Drizzle a little more caramel sauce over the top of the whipped cream and then refrigerate until serving, uncovered.